In the South Pacific, Australia confronts the law of untended purposes. The law states that if you don’t tend to your policy and political purposes, stuff goes off course and the unexpected arrives. If your attention wanders, so do your purposes. Like its cousin, the law of unintended consequences, the untended purposes law is politics obeying physics: all systems tend towards entropy, to shift from order to disorder. Awoken to our drifting purposes, Australia’s political leaders have done a pivot—offering Papua New Guinea and the South Pacific a lot of love, a bit more cash and greater policy attention. The prime minister and opposition leader are on a defence and foreign affairs unity ticket. 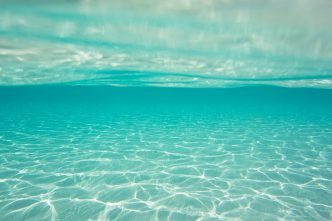 Australia’s political consensus on the South Pacific is loudly reaffirmed. Whoever wins the next federal election, there’s to be more attention and extra effort in the South Pacific. Good. It’s why the first leaders I hosted in Australia as Prime Minister have been from Solomon Islands, Fiji and Papua New Guinea. It’s time to open, I believe, a new chapter in relations with our Pacific family. One based on respect, equality and openness. A relationship for its own sake, because it’s right. So the language is agreed: new chapter, step up, front and centre, imperative. Australia acts because it sees its role in PNG and the islands directly challenged by China. Strategic denial is our oldest instinct in the region. And Canberra’s abiding instincts are aroused by the shock realisation of untended purposes. The Pacific step-up is ‘one of the highest priorities’ of the foreign policy white paper. Bipartisan agreement can power up the step-up. The polity confronts a complex discussion of Australia’s interests, influence and values in the islands. The interests–influence–values trifecta pulls in many directions. To clarify (and vastly oversimplify), view the trifecta and the pivot in two dimensions: power and Pacific people. Power competition: Australia wants to be the South Pacific’s top security and economic partner. That’s why we’re the region’s biggest aid donor. Rising competition prompts Australia to do more on Pacific infrastructure, rather than leaving this bit of the game to others (Hi, Beijing!) or merely giving via multilateral channels: $2 billion for infrastructure and $1 billion to get more Oz businesses operating in the islands. One test of the power of the pivot will be how much extra cash actually arrives, as opposed to the rebadging of the existing aid budget. 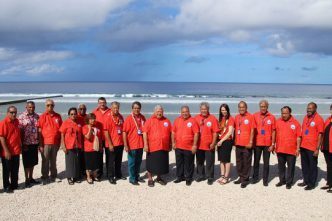 New diplomatic missions will open in Palau, the Marshall Islands, French Polynesia, Niue and the Cook Islands, so Australia will be represented in every member of the Pacific Islands Forum. 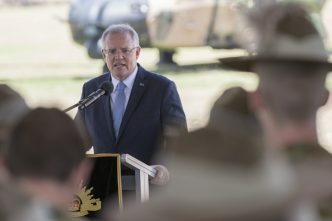 The Australian Defence Force is out and about building and partnering, to play ‘an even greater role’ in training (with an ADF team rotating through the islands), capacity-building, exercises and interoperability. The headline bit of the pivot is the US joining Australia to help PNG redevelop the naval base on Manus Island. 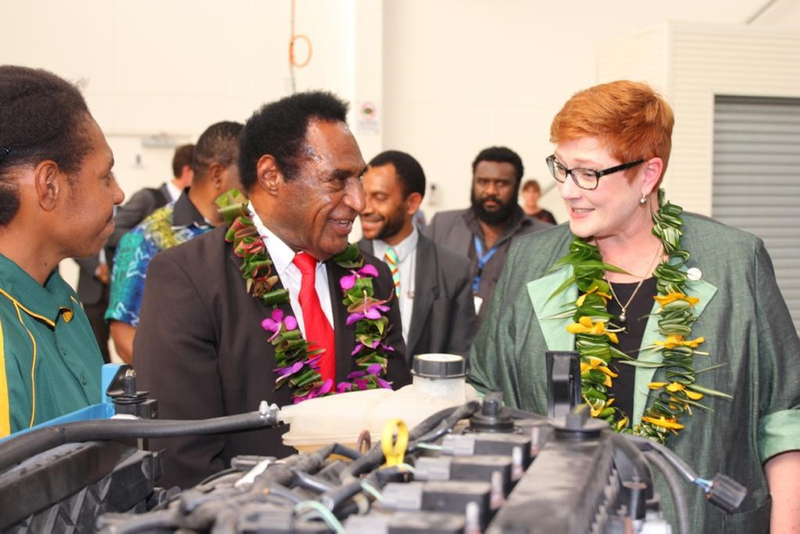 The evidence of long-term policy substance—where purposes have been properly tended—is the launch of the first of the 21 new Pacific patrol boats. The boats will be given to 12 South Pacific nations plus Timor-Leste. The promise to get electricity to 70% of PNG’s people by 2030 certainly fits under the ‘power’ category. But it also takes us directly to the vital purposes of people and values. Values and Pacific people: Australia’s Pacific policy too often doesn’t centre on Pacific people; that’s the most useful critique of the pivot merely as power competition with China. 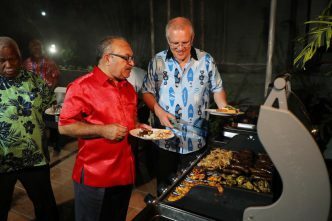 Scott Morrison’s constant use of the ‘Pacific family’ image must be more than political-speak. If the family dimension gets as much attention as the strategic struggle, Oz policy will serve its values as well as its interests. Australia is slowly talking itself back into the international media contest in the islands. That’ll be an important element in the family conversation. Letting more of the family into Australia is the big and exciting project for the years ahead. 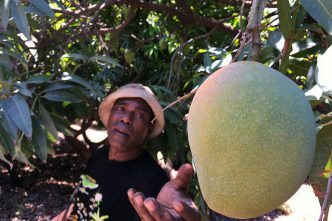 The Pacific labour scheme is to be opened to all Pacific island countries, offering chances for both seasonal and non-seasonal work in Australia. The win for the islands will need careful tending. Will Pacific workers get ‘priority’, as promised, or will many of the jobs go to those on backpacker visas? Negotiating to bring PNG into the labour scheme can be a huge step-up. One of the great silences of our Pacific policy is that almost no Melanesians can come to Australia (Polynesian access is via New Zealand). The pivot is a shift with substance if it opens Australia’s door to the people of PNG, Vanuatu and the Solomons (and, stretch the geography, to add Timor-Leste). A pivot that can marry Oz strategic denial instincts with the fundamental needs of Pacific peoples will be a policy with enduring purposes.